These Terms and Conditions govern the user’s use of the Windhoek Game Camp website. By accessing and using the Website, the User agrees to be bound by the Terms and Conditions set out in this legal notice. If the User does not wish to be bound by these Terms and Conditions, the User may not access, display, use, download, and/or otherwise copy or distribute content obtained at the Website. 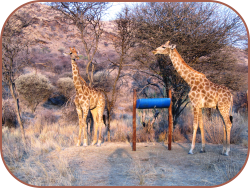 Windhoek Game Camp reserves the right to change, modify, add to or remove from portions or the whole of these Terms and Conditions from time to time. Changes to these Terms and Conditions will become effective upon such changes being posted to this Website. It is the User’s obligation to periodically check these Terms and Conditions at the Website for changes or updates. The User’s continued use of this Website following the posting of changes or updates will be considered notice of the User’s acceptance to abide by and be bound by these Terms and Conditions, including such changes or updates. The information provided by Windhoek Game Camp on this Website, are and remain the intellectual property of Windhoek Game Camp, it’s affiliates and/or subsidiaries. All such proprietary works, and the compilation of the proprietary works, belong to Windhoek Game Camp, its affiliates or subsidiaries, or any third party owners of such rights, and are protected by South African and international copyright laws. 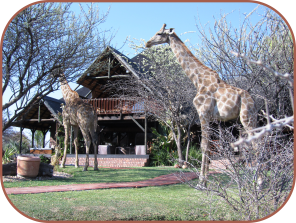 Windhoek Game Camp reserves the right to make any changes to the Website, the content, or to products and/or services offered through the Website at any time and without notice. All rights in and to the Content is reserved and retained by Windhoek Game Camp. The Website and all Content on the Website, including any current or future offer of products or services, are provided on an “as is” basis, and may include inaccuracies or typographical errors and Windhoek Game Camp, its employees, directors, affiliates and agents shall not be liable for any damage, or loss or liability of any nature incurred by whoever as a result of any action or omission. 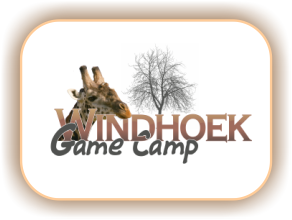 Windhoek Game Camp makes no warranty or representation as to the availability, accuracy or completeness of the Content, or any third-party content accessible via an Internet link. Neither Windhoek Game Camp nor any holding company, affiliate or subsidiary of Windhoek Game Camp shall be held responsible for any direct or indirect special, consequential or other damage of any kind whatsoever suffered or incurred, related to the use of, or the inability to access or use the Content or the Website or any functionality thereof, or of any linked website, even if Windhoek Game Camp is expressly advised thereof. The laws of Namibia shall govern these Terms and Conditions. If any of the provisions of these Terms and Conditions are found by a court of competent jurisdiction to be invalid or unenforceable, that provision shall be enforced to the maximum extent permissible so as to give effect to the intent of these Terms and Conditions, and the remainder of these Terms and Conditions shall continue in full force and effect. These Terms and Conditions constitute the entire agreement between Windhoek Game Camp and the User with regard to the use of the Content and this Website.